Selena loves to dance, so her mother takes her to Miss Tutu’s School of Ballet, where, with a lot of help from her teacher and a little help from one mischievous cat, she becomes a star! Told in rhyming verse, this is a charming picture book for anyone who loves to dance. As a child, I had a wonderful ballet teacher named Mrs. Saunders who always encouraged me despite my clumsiness. 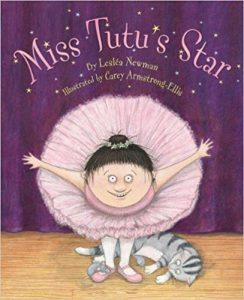 Miss Tutu’s Star is for children like me who may not have the grace of a prima ballerina, but who do have a love of dance. Because Selena loved to dance. And then Selena danced some more….